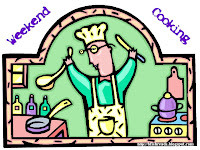 There is nothing I love more than a hardworking cookbook. Barbara Damrosch and Eliot Coleman are well-known for their books on organic gardening and for their own Maine property, The Four Season Farm. In addition, Damrosch has quite a following for her popular "A Cook's Garden" column for the Washington Post. Their new book, The Four Season Farm Gardener's Cookbook, takes us from seed catalog to the garden and into the kitchen. The first half of the book is devoted to growing your own fruits, vegetables, and herbs, and the second half focuses on how to turn your crops into delicious meals. I know I sound like a broken record, but I love the designers at Workman Publishing, and the visual appeal of the Gardener's Cookbook meets my expectations. The earthy colors and fun (but clear) fonts make the book a joy to read, and the scrumptious photographs of gardens, vegetables, and completed recipes are so inviting that you'll be inspired to either get weeding or get cooking or both! You'll also find useful and pretty garden drawings, fun lists, and practical charts. I want to say very quickly that you do not have to be a gardener to love this book. 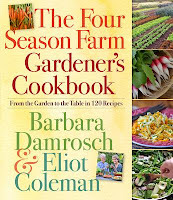 Although Damrosch and Coleman make a good case for all the reasons you might want to grow your own food, you can take their ideas and recipes to the farmer's market, local farm stand, and even the grocery store. They stress the emotional connection we make to the food we grow and harvest, not to mention the startling full flavors of just picked produce. The second half the book is all about making delicious fresh meals for your loved ones. Although many of the recipes are meat free, this is not a vegetarian cookbook. The principal philosophy behind the Gardener's Cookbook is to eat seasonally fresh foods. This is just the type of cookbook a gardener or member of a CSA needs. The key is first to harvest (or buy) produce that is at its peak and only then plan your meals. This can be a difficult mental switch for those of you who are used to planning meals and then going shopping. Yet no matter how you go about putting meals on the table, you'll love the recipes Damrosch provides. From appetizers to desserts, the flavors are varied but not extreme. There are a couple of dishes geared for the home gardener (like stuffed squash blossoms), but all the rest will work for those of us who rely on others to grow our food. The asterisks mean I either made the recipe as given or used it to create my own kitchen creation. The directions are all straightforward, the ingredients are readily available, and the tips and recommended substitutions help you find success. Furthermore, you'll be able to use this book all year round, because there are plenty of cold-weather dishes and the gardening section gives you advice on how best to store summer's bounty. At the back of the book you'll find helpful charts and resources for both gardeners and cooks. Plus the index is excellent, meaning you'll quickly be able to find whatever it is your looking for. 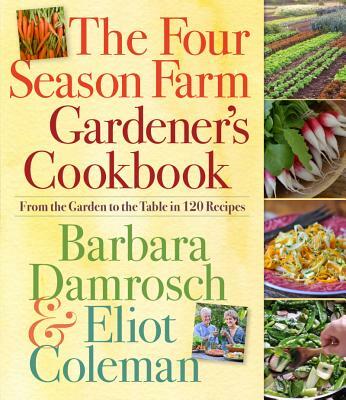 Whether you harvest your own veggies, shop for locally grown produce, or hit the supermarket, Barbara Damrosch and Eliot Coleman's The Four Seasons Farm Gardener's Cookbook will inspire you throughout the year. We love cooking greens, and I make them at least twice a week. Here's a dish from Gardener's Cookbook that we both loved, although I'd cut the maple syrup in half the next time. The recipe calls for beet greens, but a tip tells us we can use any strong-flavored green. We used mustard greens. Saute the bacon in a large skillet over medium heat, stirring, until the pieces crisp uniformly and cook to a tan color, about 7 minutes. Remove the bacon pieces to a plate with a slotted spoon and set them aside, leaving the bacon fat in the skillet. Add the beet greens, beet stems, and scallions to the skillet, cover and cook over low heat, stirring from time to time, until the beet stems are tender and the scallions have turned slightly golden, 15 to 20 minutes, depending on the size and age of the greens. Remove the skillet from the heat and stir in the maple syrup and the reserved bacon. Season with salt (if needed—the bacon might be salty enough) and pepper to taste. Serve immediately. Buy The Four Season Gardener's Cookbook at an Indie or a bookstore near you. This link leads to an affiliate program. Looks like a winner, Beth! Can't believe I was the first this week to link up too! This sounds like a great book, even though the first half would be wasted on me. We are no gardeners by any means (we tried. But the cooking part, yes, please! That sounds like a really great cookbook. I love cooking seasonally, and even though I'm not a gardener (we're in an apartment, I tend to use a lot of fresh produce. I'll definitely be checking this one out. These sound great! Well, I don't know about the Broccoli Bread Pudding, but I'm intrigued! that books books delightful. as does that recipe, now that I have found out I love beet greens! This sounds like a lovely cookbook, but I know if I got my hands on it, I'd miss our garden a lot. We have a teeny tiny balcony in our new condo, and herbs are about all that will fit into any pots we put out there! Your review makes me want to try a garden again this year! I tried one several years ago and it did well, despite my usual lack of a green thumb. The beet greens recipe sounds really good. I love those! Yum! I have a feeling this cookbook would make me want to garden. I love the quote you posted from the book. That's one of the things I don't like about living in a condo: I really wish we had more of a yard to have a garden. There is a Cooking Light cookbook that has a similar theme with seasonal recipes. I am waiting for that one from the library and think I will give this a look too. Looks like lovely recipes. Growing up in PA. I remember the corn season and strawberry quite well. You really look forward to things you get fresh at a certain time of year! I love Workman cookbooks too. Each book is so beautifully crafted, they are just a feast for the eyes. The Chicken Salad with Peaches recipe is making my mouth water. My first thought was you could use spinach for this. I want to try beet greens though. I am not much of a gardener, so this sounds like a great 'compromise' book, that I could use for ideas before going shopping. The most important point for me, was the fact that we should eat the fruit and vegetables which are naturally in season. The trouble is, we are so used to being able to buy almost everything, all year round, from the supermarket shelves, that we forget that years ago, seasonal goods were all you could buy and it never did us any harm then! The problem is, that all these fancy cookbooks, which use out of season produce in their recipes, wouldn't be bought in such huge quantities and adorn so many kitchen shelves! My dad's a fantastic gardener. He can grow just about anything! Not me. I'm glad you mentioned that we don't have to be gardeners to appreciate this book. Okay, you made it absolutely impossible for me not to get this book! I want it NOW! Wow, I wish I'd seen this recipe before I made the recipe from my post this week? I tossed my beet greens, ugh. I'm pinning this for next time, though. It sounds like a lovely way to use up everything! This cookbook sounds and looks great. What a eye-catching cover! I really, really want this cookbook now. We just purchased our first garden plants of the season (tomatoes and herbs) and they're waiting on the porch for planting weather to get here. I have one seasonal cookbook now and I love to use it as a resource. Thanks for sharing this one. I'm going to put it on my Mother's Day idea list. Sounds like a great book! The farmers markets are open now and it puts me in the mood to cook with local, fresh stuff. As soon as my kitchen is done . . . This one looked right up your alley.